"Call for Artists: Juried Exhibition and Residency Opportunities"
The award-winning, non-profit international arts organization TransCultural Exchange is reviewing slides to select innovative artists for future international projects and, specifically, for the exhibition Shimmer at TransCultural Exchange from November 1 to November 30. TransCultural Exchange also announces a sponsored residency at the 6th annual Dorothea Fleiss East West Artists Symposia and Residency from August 3 - 13, 2006 in Carei, Romania. The award-winning, non-profit international arts organization TransCultural Exchange is reviewing slides to select innovative artists for future international projects and, specifically, for the exhibition Shimmer at TransCultural Exchange from November 1 to November 30. All media are acceptable, including site-specific and interactive installations. TransCultural Exchange will pay for insurance during the exhibition, exhibition announcements, a modest brochure, opening reception, and web-site documentation of the exhibition. Sales encouraged: 20% commission. Please send a maximum of 15 representative slides or a CD of 15 works (no minimum required), a resume, optional statement, $15 review fee and SASE to TransCultural Exchange, 516 East Second Street, #30, Boston, MA 02127. www.transculturalexchange.org, Submission deadline is June 1, 2005. The award-winning, non-profit international arts organization TransCultural Exchange announces a sponsored residency at the 6th annual Dorothea Fleiss East West Artists Symposia and Residency from August 3 � 13, 2006 in Carei, Romania. 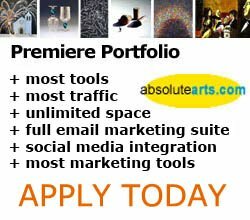 This 10 day international artist residency is open to artists in all disciplines and includes modest housing, workspace, meals, minimum materials and a $500 stipend to be used towards the artists� airfare. The residency will culminate in an exhibition at the Municipal Museum of Carei. (There are no residency fees, although the artist is requested � but not required � to donate one work produced during the residency to the Municipal Museum of Carei.) One to two artists will be chosen to attend this residency, for which the remaining slots are by invitation only. (The list of invited artists is available at http://www.transculturalexchange.org under �To Participate�.) Additional artists will be chosen to participate in the symposia�s exhibition at the Municipal Museum of Carei. Submission deadline is April 1. Please send a maximum of 15 slides or a CD of 15 works, SASE, resume, $15 review fee and optional statement.